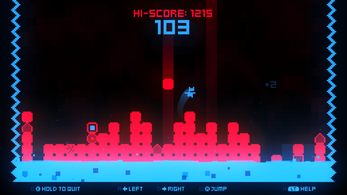 " Score-hoarding arcade jumparound for one or more players. You have been sentenced to death in the Bit Pit, where blocks of various deadliness are thrown down upon you like old boots down a well. The blocks build up, allowing to climb away from the pool of acid below. " This is a quick, jam-quality, proof of concept game made over the course of a few days to demonstrate and try out an idea. It's 1-4 player local co-op. You can use a keyboard or gamepad for singleplayer, but you'll need a gamepad for each additional player. All settings can be changed at any time using keyboard keys 1 through 0. 1 & 2 - Change SFX volume. 3 & 4 - Change music volume. 5 & 6 - Change resolution. 0 - Randomize hue (also Right Trigger). Awesome game! I love it!!!!!!!!!! I would love to play, but it fails to execute at line 1? Great game, I found the little hidden soundtrack you had there, with the poorly played flute, gotta improve those skills. This game is VERY entertaining and I'd LOVE to see more come out of it. I give it an 11/10 on YELP. Well um is it 2 player atleast on keyboard? This was fun. The visuals, while simple, worked really well for what was going on. Neon against black is always a nice choice. The music was pretty good as well, though the menu was louder than in-game for some reason. A fine way to pass time alone or with others in competition. Good job with this overall. Keep up the good work and have a video. it's probably because it's trying to download a text file from an internet address that doesn't exist. if you disconnect your wifi/ethernet before starting the game it works. yep exactly, it's work fine without internet, thank you! the game looks nice but when I launch it from the itch app on OS X I get stuck on a black screen with some kind of error text. I gave Bit Pit a quick playthrough on my weekly series Games and CHiLL. The game is so simple and so much fun! I want to give it another quick playthrough with my girlfriend who's not much of a gamer but would likely love games like this. I think i found an Easter Egg. Hey Logy Bit, whats your hi-score? My high score is 1998. When I saw my high score, the game said "WTF how?!" works now high score is 1495! I keep having a problem when I launch the game. A black screen appears and then disappears really quick and the game crashes. I ran the game in the terminal, and after the black screen part, the terminal shows "segmentation fault, core dumped" I've been looking around, but cant find anything helpful. Try to run the game in the terminal with the "-force-opengl" parameter. Hey, our mistake there, sorry. The intro song is "Technopop 7b" by TeknoAXE. 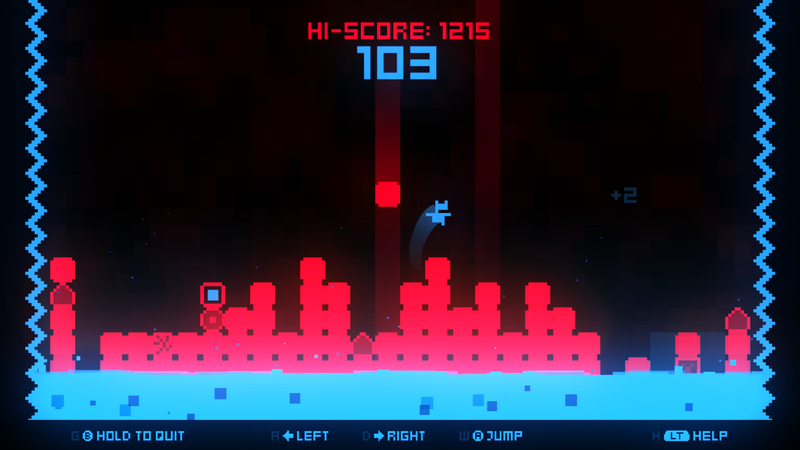 Have you had an inspiration of a sinister version of tetris to this game called Bit pit it? On Debian (x64) I'm having issues with libraries, any way to fix it? As your system is 64-bit, but the game build is 32-bit, you should install 32-bit versions of required libraries via the system's package manager. Will you ever put a story mode that you can finish into the game? Any luck getting this game on mobile? Been fiending to play this since it was announced. Honestly can't promise anything, but we are considering it. Hey! Currently you can only play multiplayer with your friend if you have at least one gamepad, sorry. Oh, okay, thanks for responding! Thank you for giving me something quick to play as a break in between studying! P.S. : The lack of balancing does show quite a bit.